We will explore how we can achieve important synergies from new Centennial legislative authorities, from Find Your Park, from the new Robert Redford-narrated movie commissioned by Brand USA, from the consequences of outreach to America's 4th graders through Every Kid in a Park and from new awareness of the economic importance of our parks regionally and internationally. Details: Our meeting will officially begin on Sunday morning, November 8, although pre-meetings and an informal welcoming reception are planned for Saturday afternoon and evening. Monday and Tuesday meetings will include participatoin by senior officials of the National Park Service, the National Park Foundation, the National Parks Conservation Association and other key park-related organizations. Wednesday meetings will include a key strategic planning session for NPHA members. NPHA members and meeting participants are offeres a special rate of $159 single or double, plus taxes and fees. Lodging is available at the special meeting rate for several days before and after the NPHA meeting. Reservations must be made by October 7 and can be made by phone at (800) 634-7711. Please identify yourself as a member of the National Park Hospitality Association when booking to assure the discounted rate. Transportation: Excellent access to our meeting location is available through the Colorado Springs Airport (COS) (15 minutes) and Denver International Airport (DEN) (90 minutes). Shuttle service is available through the hotel to both airports by calling (719) 362-3276. One way rentals from Denver to and from the Broadmoor are available through Hertz - (719) 519-4473. The deadline for "Early Bird" registration is Friday, September 25, 2015. All registrations are discounted $50 from the rates shown above until that date. Cancellations made prior to that date will not incur a fee. A $100 fee will apply for cancellations made between September 25 and October 30, and a $200 fee will apply for cancellations after October 30. Download the registration form here. Registration forms can also be faxed to (202) 682-9529 or emailed as PDF attachments to npha@funoutdoors.com. Attire: Resort casual for all functions. November weather in Colorado is usually great. Anticipate highs in the mid-50s and lows of about 30, sunrise at 6:30am, darkness at about 6:15pm. Chances of sunshine are high - 70+%. Displays: Regular and associate members are invited to display information on new products, promotions and offered services. Special focus will be on healthy foods and the application of new technologies to park visits. 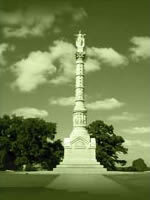 Arrangements for displays should be made through the National Park Hospitality Association at (202) 682-9530.